People with diabetes are generally at a greater risk if they catch flu (influenza) as it can pose significant difficulties with diabetes management. Flu is a viral infection which is easily caught through inhaling small droplets released when someone with the flu virus nearby coughs or sneezes. A dangerous complication of the flu is pneumonia and people with diabetes are more at risk of developing this complication than people without diabetes. Flu, and other viral infections, can lead to higher blood sugar levels and increase the risk of serious short term complications risk, particularly short term complications such as ketoacidosis and Hyperosmolar Hyperglycaemic State (HHS). Read more on getting vacinated against the flu. 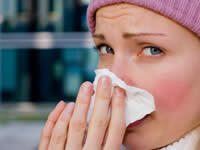 Influenza can lead to chest infections which may develop into pneumonia. Rarer complications include tonsilitis, meningitis and encephalitis. The flu can be a killer and is responsible for around 600 deaths a year. During an epidemic, flu can kill thousands of people in a year. Some over-the-counter flu medication is suitable for people with diabetes. Some over-the-counter flu medication will be more suitable for people with diabetes than others. For instance, some flu medications contain non-steroidal anti-inflammatory drugs, such as ibuprofen, which are not usually recommended for people with diabetes because they may slightly increase the risk of heart problems and stroke. A number of flu medications may contain a relatively high level of sugar which could present a certain amount of increased difficulty with managing blood sugar levels. Lower sugar versions should usually be available and your pharmacist should be able to help you to pick an appropriate medication. Remember, flu medication only treats the symptoms whilst the body recovers. How will flu affect my blood sugar? Flu usually causes an increase in blood glucose levels, although people on hypo causing medication may be at risk of too low sugar levels if insufficient carbohydrate is taken whilst ill. If (in most cases, when) you get flu, it is important to check blood glucose levels more regularly than usual. Whilst you have flu, check as often as possible, because the feelings of illness can mask symptoms of high or low blood sugar. For this reason, you could develop hypoglycaemia or hyperglycemia without realising, both of which can be serious if not treated quickly enough. Frequency of blood glucose testing depends on your particular circumstances and the medication you take. If you are on hypo causing medication, it is advisable to test every few hours to monitor whether your sugar levels are going too high or low. If you are not taking any hypo causing medication, blood glucose testing may still be useful for ensuring sugar levels do not advance too high. If you take insulin, charity Diabetes UK recommend checking for ketones if blood glucose levels rise above 15 mmol/L. If your ketones become too high it is possible to fall into a diabetic coma and this can be fatal if untreated. Ketones should be checked regularly, and your diabetes healthcare professional should be able to inform you about ketone testing. What can I eat if I have diabetes and flu? Many people with diabetes don’t feel hungry or thirsty if they have flu. However, it is important to continue eating a healthy diet and drinking regular fluid to help manage your blood sugar and diabetes. Ideally, don’t vary your regular meal plan too much. If you cannot eat, it is advisable to consume drinks with carbohydrate in to provide your body with energy. Keep monitoring your blood glucose levels closely and ask your health team if you need advice in managing your blood glucose levels. Am I entitled to a free flu vaccination? People with diabetes are considered an ‘at-risk’ group when it comes to seasonal flu. Vaccinations are available across the country from October through to early November. Seasonal flu is a serious illness, and because people with diabetes are considered at particular risk, vaccinations are free in the UK. Dippy3103: I am sore and itchy at the injection site, but it beats the hell out of getting flu. My employer now offers it to all staff, and if I didn't get it on the NHS I would have it through my employer. I guess they feel if they stop a few cases of flu then they save on sick pay and reduced efficiency. The mild discomfort in my arm is worth it to reduce my risk of flu. Anniep: I had mine yesterday and no problem at all. Previous years I have had a sore arm for a day or so this year I can't even tell where it was done. For those of us at more risk it is always worth getting it. Celtic.piskie: The normal 'flu vaccine is always combined with varying strains. The swine flu vaccine is absolutely no different to a normal flu vaccine. The only reason it was delivered separately last year was because it was an emergency situation. Cugila: There are many of us who have done our own research into the Flu jab and its constituent parts. I for one will be having it this year and the next etc. I have never had a problem with it and know plenty of people who also have never had a problem. As far as I am concerned it protects me from what could be a nasty bout of Flu - sounds good to me. How do you cope with being ill?